Small businesses and large commercial enterprises both value the services we provide at Citrus Lock & Security. As a leader in small business locksmith work, we strive to consistently help our customers achieve the security and service they need. Given the amount of employee turn over and security issues most businesses face, they often require a locksmith to regularly change their locks to insure their enterprises are safe and secure on an ongoing basis. 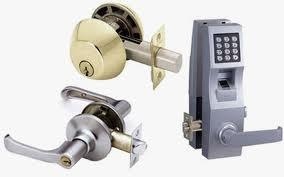 We specialize in Re-Keying, Installing or Servicing Multi Level Master Key Systems, Installing Deadbolt Locks, Bump Proofing Existing Locks, High Security Locks, Panic Bars, Door Closers, File Cabinet and Desk Locks, Changing Safe Combinations, Installing Leverset Locks, Keyless Entry Locking Systems, etc. 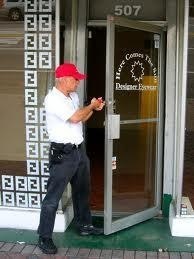 One of the frequent tasks we perform is handling a business lockout. Whether you have a small business or large commercial enterprise, Citrus Lock & Security is always prepared and standing by to get you back inside. Whether it is during the day or in the middle of the night, you will always speak directly with the Locksmith; I guarantee it. We do not believe in answering machines or even worse, some live "after hours" answering service. First, you have to relay all your information to the "service". Then after they get off the phone with you, the "service" has to call a Locksmith and relay that same information all over again to him or her. In the mean time, you and or your employees are standing around hoping a Locksmith has received all the information correctly from the "service" and will eventually show up. Too much valuable time is lost along with your company's productivity. When you call us, we arrive at your location as quickly, efficiently and as inexpensively as possible so everyone can get back to work with minimal down time. I guarantee it! 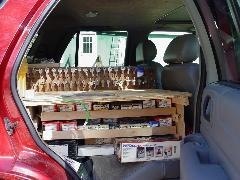 Our service vehicle is a complete "shop" on wheels; complete with a 120 volt power inverter. This enables us to cut a wide variety of keys right at your location; whether it is a simple key duplication or cutting keys by code to replace lost keys that need to be fitted to your existing locks. Our vehicle is also equipped with GPS which enables us to arrive at your location quickly and economically; which in turn saves you valuable time and your hard earned money. Sometimes we discover that we have to fix broken or troublesome locks. Our first priority is to diagnose the problem and if at all possible, repair it. If we find the lock is too far gone to be repaired, then with your approval, we perform a lock replacement. We can then re-key the new lock to fit your existing keys; thus eliminating the need to carry a separate key. Most times, it is very difficult to fix a lock if it is found the existing problem is anything other then a troublesome cylinder or a worn key. We specialize in lock replacement and have a large selection of locks in our service vehicle including Lever Locksets on the most popular key ways. The Lever Locksets are minimum Grade 2 ANSI & are ADA (Americans With Disabilities Act) compliant. Most times, we find upgrading to Grade 1 Standards is not necessary under "normal" usage but, are available upon request. We also stock the Commercial "Adams Rite" Store Front door locksets. Small businesses and commercial enterprises both have a wide variety of locksmith needs. These include needing basic help installing locks and locking systems for their offices, handling lock needs for filing cabinets, padlocks, and other miscellaneous locks used around the office. All enterprises, whether large or small, need a good reliable Locksmith to help with all of their business lock installations, re-keying or master keying needs. Protect your employees, your inventory, and your sense of safety by consulting with Citrus Lock & Security to secure your business. We are available 24 hours a day, 7 days a week. We also install and sometimes repair door closers and panic bars. These devices are essential for businesses when considering their security needs. Having these devices installed truly helps give your employees the feeling that their office is secured and they are safe.